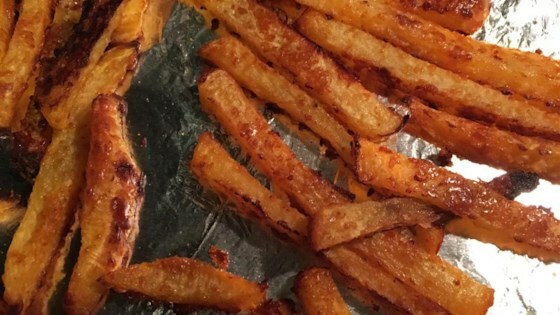 "My daughters and I are on a low-carb diet and were looking for something to curb our 'French fry' cravings. I've heard that turnips can be made into some great 'fries.' I experimented with it and came up with this. You can add whatever spices you'd like." Peel the turnips, and cut into French fry-sized sticks, about 1/3 by 4 inches. Place into a large bowl, and toss with the vegetable oil to coat. Place the Parmesan cheese, garlic salt, paprika, onion powder in a resealable plastic bag, and shake to mix. Place the oiled turnips into the bag, and shake until evenly coated with the spices. Spread out onto the prepared baking sheet. Would have given it three and a half......but can't. They were good ,I would probably add something else , I just don't know what. I have a feeling these are an acquired taste. i thought this was pretty good. i used a generous amount of melted butter instead of the oil. i recommend cutting the turnip slices quite thin so they are a bit crispy. For turnips this is actually good. I was surprised. I don't think turnips can get any better.